You should not mistreat them. What goes around comes around. 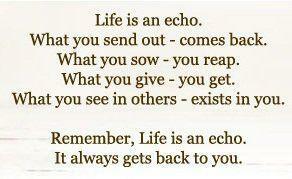 “What goes around comes around” or “as you sow, so shall you reap” is the basic understanding of how karma, the law of cause and effect, works. The word karma literally means “activity.” Karma can be divided up into a few simple categories — good, bad, individual and collective. Depending on one’s actions, one will reap the fruits of those actions. The fruits may be sweet or sour, depending on the nature of the actions performed. Fruits can also be reaped in a collective manner if a group of people together perform a certain activity or activities. Everything we say and do determines what’s going to happen to us in the future. Whether we act honestly, dishonestly, help or hurt others, it all gets recorded and manifests as a karmic reaction either in this life or a future life. All karmic records are carried with the soul into the next life and body. There is no exact formula that is provided for how and when karmic reactions will appear in our lives, but one can be sure they will appear in some form or other. One may be able to get away with a crime they committed, or avoid paying taxes, but according to karma, no one gets away with anything for long. 1. God is cruel for letting things happen the way they are. 2. Things are happening completely by random chance and that there is no rhyme or reason behind them. 3. Perhaps in some inconceivable way, I had a hand in my own suffering, even if I wasn’t able to recall what I had done. I didn’t like option two because I just couldn’t accept that things were moving about randomly. I always felt there had to be some kind of order to the universe. Since I grew up believing in God, I was ready to wholeheartedly accept option one because this option allowed me to point a finger and express my anger and frustration at someone who I had worshiped all my life. In search for an answer, I started reading the Bhagavad Gita and other Hindu texts which hinted at option three. This was even more difficult than the first option because now I couldn’t really point a finger at anyone other than myself. The Gita broadened my horizons about life and encouraged me to take responsibility for my own actions and not to place blame. It explained that each of my previous lives has impacted my subsequent lives and is probably affecting my current life. A karmic reaction, good or bad, may or may not become manifest in the same life. It may manifest in a future life. It’s also possible to get hit with a few reactions — positive or negative — at the same time. The simplest analogy I can think of for how karma works is that of a credit card purchase. You make the purchase now, but don’t get hit with the bill for 30 days. If you made several purchases during one billing cycle, then you’ll get hit with one big bill. The natural question that arises is: “Why am I getting punished for something from a previous live if I can’t even remember it?” Of course, we don’t ask ourselves why good things happen to us. We simply accept the good thinking we deserve it or that we’ve earned it. We forget a lot of things we’ve done in the past, so what to speak of things done in a previous life. The most important lesson to learn is that we can become more mindful of our present actions to prepare our families and ourselves for a more prosperous future, both materially and spiritually. An important question we should ask is: “Do we really want to remember our past lives?” The pain of dealing with the hardships of this one life is difficult enough. We can only imagine how long we would actually survive if the weight of our previous lives’ pain and suffering were compounded onto our psyche. For the most part, it’s probably a good thing that most people don’t remember what happened in previous lives, so that we can start to move forward in our present life. Karma doesn’t translate into indifference towards the suffering of others. The mood should never be “too bad, it’s their karma.” The predominating principle should always be that of sympathy and compassion. This can seem like such a vicious cycle of action and reaction. It’s practically impossible to live in this world without doing some wrong, whether out of anger, revenge, or just inattention. The teachings of the Gita and Hinduism are all about breaking this cycle of karma and transcending the material world and regaining entrance into the spiritual world. The path of Bhakti Yoga, which includes mantra meditation, conscious cooking and eating, and devotional service help break the cycle of karma by gradually removing the karmic reactions we have accumulated and thus liberating us from the repetition of birth and death.